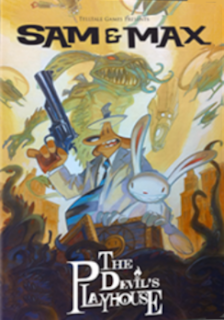 Sam & Max: The Devil's Playhouse is the third season of Sam & Max. It was released in 2010. It used the direct control methods of Tales of Monkey Island, and had multiple cursor icons in the inventory for select, examine, or use (the use squeaky toy and Sam's hand cursor images were from Hit the Road). Only The Penal Zone has been released for iPad, however it was removed from the iTunes App Store and is no longer available for sale. The retail versions are now out of print, but the digital versions of The Devil's Playhouse for platforms other than iPad can still be purchased, however. The digital version for PC and Mac is available from the Telltale store and Steam, and the digital version for PC is available from GOG.com. Max must use his new psychic powers to stop the evil Skunkape from taking over the Earth. Sam & Max relive the adventures of their grandparents as they unearth the secrets of the tomb of Sammun-Mak. Max's brain has been stolen, and Sam has to get it back. Many barely-clothed doppelgangers of Sam ravage the city. The third season of Sam & Max concludes in this episode.